Walsall defender James O'Connor has signed a new one-year contract with the League One club. The Birmingham-born 30-year-old, who came through the youth ranks at Aston Villa, originally arrived on a one-year deal from Derby County last summer. 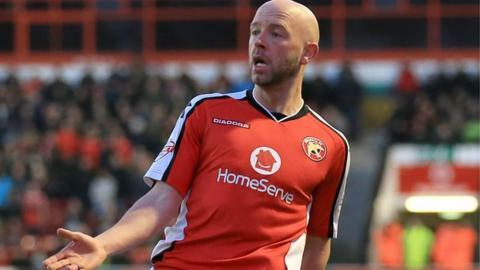 But, despite the disappointment of being left out of the Saddlers' Johnstone's Paint Trophy final team, he had a steady first season at Bescot. "I was pleased with my form in the second half of last season," he said. James O'Connor made 35 appearances for Walsall last season, scoring once in a 3-2 home win over Rochdale in mid-February. After a short spell on loan at Port Vale, he left Aston Villa to sign in 2005 for Bournemouth, initially on loan, before joining Doncaster Rovers, where he spent the majority of his career. He left in 2012 for Derby and has since also played for Bristol City on loan. "Now I want to kick on from there. And I am happy to get things sorted. "I'm proud of our defensive record last season; on the whole we worked well as a unit, it was just disappointing that we couldn't challenge for the play-offs. "With a good start to the season and some momentum, I can see no reason whatsoever why we can't be up there challenging during the campaign ahead. There are no real stand-out teams and with the quality we have here, we have to aim as high as we can." Walsall finished 14th in League One, 10 points outside the play-off places, but having also experienced their first trip to Wembley.